Wishing all my blog friends a most joyous Feast of the Resurrection of our Lord Jesus Christ! 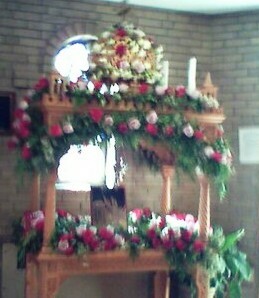 I’m not sure if the photo caption will show up, so — this is a photo of the Kouvouklion, or Tomb of Christ, at my parish church. I am always ambivalent, at best, about Greek Orthodox practice, but this particular tradition is one of the most beautiful — covering the Tomb of Christ with flowers. After the icon of the crucified Christ is venerated, it is removed from the Kouvouklion and placed on the altar, and instead, the icon of the angel greeting the Myrrh-Bearers is displayed. I’ve never seen this tradition anywhere else but in the Greek Orthodox Church — does anyone know if it’s a universal Orthodox tradition? The one year I was at a Russian parish, I noticed they didn’t do this. Last night, our parish choir was singing the Hymn of Kassiane. Now, this choir consists of six or seven old bats, including yours truly — 3-4 sopranos, 3 altos, and one bass, normally, plus a woman who is trying to figure out the tenor part, having spent the past couple of years trying to sing alto, which turned out to be too high for her range. The Kassiane arrangement by Nicholas Roubanis is not the easiest piece of music on the face of this earth, and when I taught it to the same choir, umpty-scrunch years ago, it took us eight weeks to learn five pages. So last night, we were a bit “trepidatious,” if that’s a word (spell check says it isn’t), hoping we could pull this thing off with just one bass, who hadn’t been able to attend rehearsals for the past month. That son-of-a-gun had de-vested in the sacristy, slipped out a side door, down an outside corridor (so no one would see him leaving), and sneaked up to the choir loft!! And we had the benefit of his wonderful bass voice for this piece! The relief was palpable. Afterwards, one of the ladies, who had been a great fan of the departed priest, nodded and said (of Father Count), “He’s a good egg.” High praise indeed. I have never seen a priest do this before, and when I thanked him, later, he said that he used to do this all the time in his old parish, where he was an assistant priest — he’d sit in at the organ if the organist needed to slip out, or provide a tenor or bass for a difficult piece. My jaw is still hanging open. If this priest leaves us, I don’t think the parish will ever recover. I know I won’t. A post scriptum: Thank you to everyone who has offered prayers and good wishes for the next round of horror. I hope it won’t be, but experience suggests otherwise, and I feel I would be foolish to expect anything but the worst. Thanks, too, for putting up with my negativity on the subject. For whatever reason, I’ve been thinking back a good deal lately, to when I first became Orthodox. Tonight was no exception. Seventeen years ago, there I was, fumbling around in The Book, desperately trying to keep up with a priest and a chanter who had been doing this thing all their lives, literally. And for some reason, the melody that stuck in my ear that year, and every year since, was, “Behold the Bridegroom cometh in the middle of the night, and blessed is that servant whom He shall find watching; and again, unworthy is he whom He shall find heedless.” I don’t know why this melody so appeals to me, but it does, so much so that a couple of years later I leaned over to my husband and said, “I just love this part.” And he whispered back, “Do you know what they’re talking about? !” in a tone of pure horror — he’s always had a Thing about death — and I said, of course, “Yes. Isn’t it wonderful?” I’m sure he thought I’d lost my marbles. I think his Thing has a lot to do with all those Requiem Masses he served as a kid, all that Doom and Gloom and Death and Damnation. I can’t say that that has never worried me — if you have any brains at all, the thought of that face-to-face encounter with your Creator should at least give you pause — but I don’t dread it so much that I’d put it off at all possible costs. I mean, it’s not like you could put it off forever, right?! And then, this time last year, I was standing with the choir, having just sung the Hymn of Kassiani — yes, I know that’s tomorrow, but it’s the time of year generally that I’m thinking about — glaring down at the cause of my exile from the parish, Father Let’s-Drag-This-Hopelessly-Antiquated-Church-into-the-Twentieth-Century (and yes, I know it’s now the 21st century) — and I remember transferring my glare to the icon of Christ on the iconostasis and saying, “Ya know — he’s been with us six years now. You transferred Fr. Dean out of our parish after six years. It’s Time for this character to Go.” And I had no idea that at that point, he either had his marching orders already or was within days of receiving them. What a difference a year makes. This year, we had “Father Count” up there chanting the Troparia, helping out the chanter and his two assistants, pouring all his heart and soul into what he was singing, and doing it with the most exquisite voice this side of Paradise. Well, so. When the Bridegroom comes for me, will I be ready? Probably not. There’s always something you meant to get around to and never did. I keep telling Him that if He doesn’t mind, I’d just as soon put it off another couple of years — after all, if I go now, my husband will be stuck with his father’s affairs, which give new meaning to the word “labyrinthine,” and there are also my numerous cross-stitch projects, some of which I’d like to get done. And I’d also like to have a clue as to whom I should leave all my needlework paraphernalia to — my daughter isn’t interested, and she has no daughters, and my son refuses even to consider marriage, so that avenue is closed. The question assumes an uncomfortable immediacy as of May 20, when I go in for another round of surgery, to repair a hernia caused by the last round of surgery. The thought of going through all that again is daunting, and frankly makes the prospect of death not all that unpleasant. After all, if I died, at least the ghouls couldn’t get their hands on me for a third round. But there’s that Preparedness thing. So no, I’m not ready. But at least I would know, one way or another, where I’ll be spending eternity. At least that question would be solved. A) FOUR PLACES I GO OVER AND OVER: Church, supermarket, school, Dad’s. B) FOUR PEOPLE WHO ENCOURAGED MY FAITH ALONG THE WAY: Fr. Dean, Fr. Basil, Fr. Costin, and all my internet cronies, who are far better Orthodox Christians than I’ll ever be! C) FOUR OF MY FAVORITE FOODS: hamburger, salmon, rote Grütze with ricotta cheese, strawberries-peaches-and-cream. D) FOUR PLACES I WOULD RATHER BE RIGHT NOW: (OK, Jim, this one’s for you) Church, church, church, and church. Seriously. F) FOUR THINGS I LIKE ABOUT THE ORTHODOX CHURCH: The joy, the take on hell (it’s the Presence of God for anyone who hates God), the Horologion, the music. G) FOUR OF MY FAVORITE HOBBIES: Reading, knitting, cross stitch, bicycling — when I could cycle. In case there is anyone reading this not familiar with this character, it’s a puppet, complete with black cape, widow’s peak hair, slightly slanted eyes, fangs, and a Romanian accent. He always introduces himself: “Greetings! I am the Count. Do you know why they call me the Count? Because I love to count things.” His chief purpose is to provide the numbers component of Sesame Street, but there are usually a number of off-the-wall puns that make The Count my favorite character. Mimi wrote me the other day to ask if we still had snow in New Hampshire, and the answer is: Yes and No. I went to visit my stepfather yesterday. It’s confirmed that he had a mild stroke at the end of last month, and now he needs 24/7 supervision, so yesterday was my first bit. On the way up to his house — he lives about 15 miles north of my house — I was noticing the gradual progression of snow piles, from nonexistent at my end to about a foot of solid ice along his street. But then, his street is a long country road lined with pine trees, so it will take the sun awhile to get to all that grubby stuff; and then, as I noted, it is solid ice by now. But at my end, it’s pretty much all gone. I have a Catholic church next to my house, complete with that huge expanse of lawn that all Catholic churches seem to have (even in the cities), and there is still a respectable pile of snow around the edges of that lawn, where the snow plow dug out the church driveway. But in my yard, the last of it melted today. I can hardly believe it. I have just tried to insert a photo we took of the pile of snow in our driveway at the beginning of March, and you can see that it’s about as high as my husband, who’s 5’8″. I won’t say I thought it would never melt, but there were times when it was tempting to wonder. It occurs to me that it’s been awhile since I posted anything about our “new” priest, who has now been with us for nine months. As you know, I’ve been working three days in the church office, and so far it’s been working out all right, except that over the past seven years, I actually somehow built a life for myself without being aware of it, and now the job is impinging on my life. However, the up side is that I get to see Father just about every day but Wednesday — it’s his day off, and mine too, and the other day I don’t work (Tuesday) is Bible study. We are not good for each other. We feed off each other. He has a wicked sense of humor, and is very sharp with it, so I’m always either laughing at something he’s said, or making a quick comeback, and he’s laughing at what I said. One of my favorite comebacks is, “You’ve been in this country way too long, if you know that.” Two examples: In reviewing new music with our choir (the only priest I know who actually comes to rehearsals and assists the choir director), he noted that the word “our” in “Our Father” had a letter R pencilled in, to remind the choir to sing the word “R”. “Arrr,” he said, “it is a pirate Lord’s Prayer!” Looking very pleased with himself. Then there was Bible study this past Tuesday, on the Gospel of John, which is always heavy going, even with the best group — and at 61, I’m the youngest member of this group. He was relating something in Chapter 3 to our being part of Adam’s family, then smiled and said, “Addams Family.” I don’t know if anyone else even got it, but I cracked up. And on Thursday, I forget what we were talking about, but we were having such a good time that the sexton remarked, “I thought you two just had juice for lunch. What the heck was in it? !” I dunno, maybe it was his mother-in-law’s Romanian borshch that he shared with me. I have not yet gone to confession with him. I do, however, have the blessing of my current confessor to do so — face it, at $3.00+ per gallon of gas, even a car that gets 40 mpg is going to burn a lot of fuel over 80 miles round trip. But I was very impressed when someone came in for confession, and he spent two hours with that person — I’m always relieved to know that a priest takes confession that seriously. I mean, really — classical musician, Ph.D. in physics, in-depth theologian, and a great sense of humor — does it get any better?! I pray daily that he stays with our parish for a long, long time! !